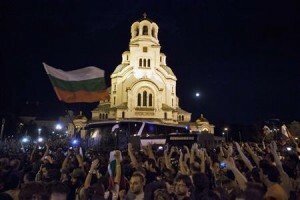 Anti-government protests in Bulgaria’s capital have been going on for 40 days, and escalated Tuesday evening as several hundred demonstrators trapped the officials inside Parliament in a bid to oust the left-leaning government. (Reuters) – Hundreds of protesters built barricades around Bulgaria’s parliament, effectively trapping over 100 lawmakers, ministers, and journalists in the building for more than seven hours on Tuesday following a brief scuffle with police. Protesters pulled out sidewalk tiles and piled garbage bins to cut off roads to Bulgaria’s parliament, shouting “Mafia!” and “Resign!” and “Red Garbage!”, to keep the deputies under blockade until the Socialist-led government steps down. 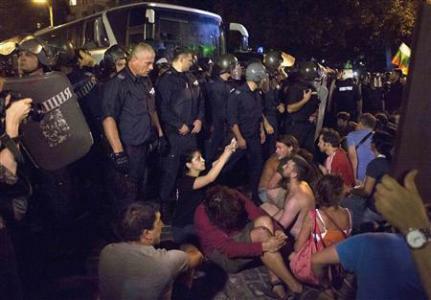 An earlier attempt to get deputies out of the parliament with a bus led to a scuffle with police. It was aborted after protesters threw bottles and other objects at the bus, while others sat in front of it. Thousands of Bulgarians have been protesting almost daily in Sofia since last month following a government decision to name a powerful media magnate as security chief, which many see as an example of private interests controlling state institutions. The government’s withdrawal of the appointment failed to quell public discontent in the European Union’s poorest country, which also is one of the bloc’s most corrupt. Seven protesters were treated for head injuries, the national radio said. Two police officers were also wounded.